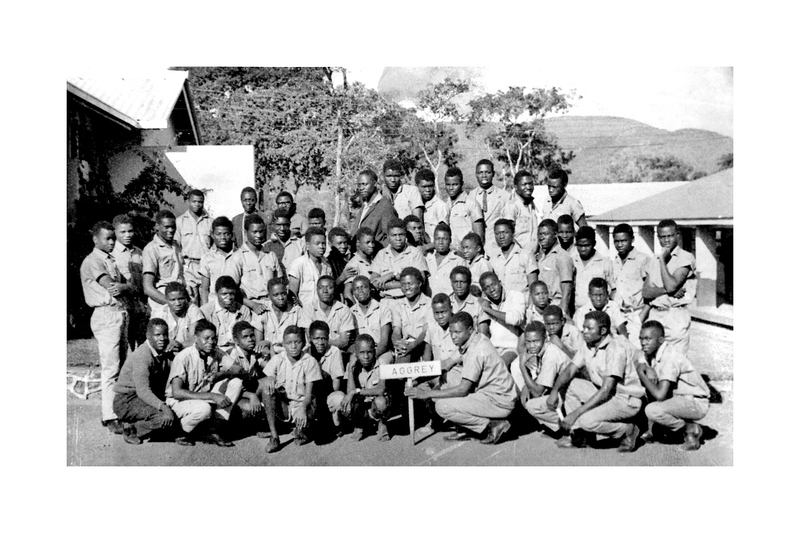 One chilly June morning when I was in Grade 7 at Tamanda Boys Boarding Upper Primary School in 1966 in rural Chipata in the Eastern Province of Zambia, the Headmaster Mr. Phiri digressed from teaching English, and asked the class of 30 students what we wanted to be after completing Grade 7. My classmates and I looked at each other blankly in stunned silence. What could kids in a rural African village school dream about after finishing only Grade Seven? Then Mr. Phiri gave us this spontaneous talk that I will never forget for the rest of my life. UZ Spokeman – the first University of Zambia student newspaper. 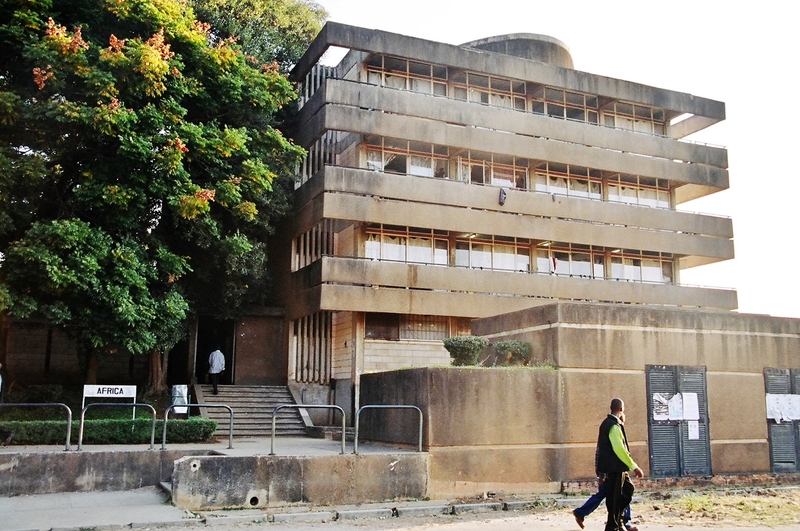 The author at 15 years old stood in awe at Africa Hall at the University of Zambia then under construction. school donated ten ngwee or ten cents toward the national project. Members of Aggrey House at Chizongwe Secondary School in 1967. Lusaka then was known as the Garden City because of its bungalows and marvelous wide front yards and lawns. There were no walls surrounding houses. So you could see the beautiful front yards of all homes with flower gardens, their broad living room glass windows and colorful curtains. Then I rode my bicycle on a bush path through what is now Arcade Mall or East Park Mall to UNZA. I emerged from the bush path to see Africa Hall and Kwacha Hall but President and International Halls were still incomplete. There were cranes and loud construction sounds everywhere. I stood by my bike and stared in wonderment at the new University of Zambia being built with the administration building and the Library in the far distance. I was in Form three or Grade 9. 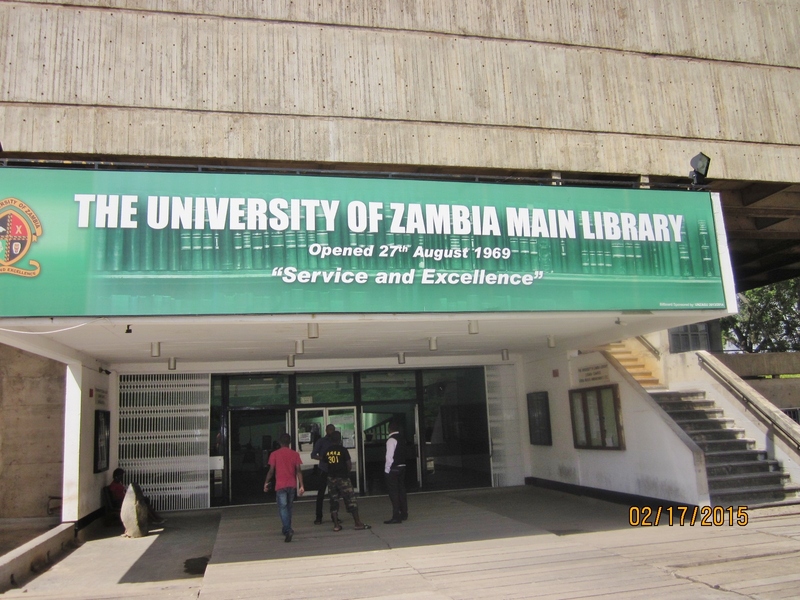 I was in awe to be and see the University of Zambia; the seat of knowledge. I wondered what it would take for anyone to be at University of Zambia. I retreated and returned to Northmead. In-a-Hurry UNZA student newspaper the author co-founded with Dr. Vincent Musakanya in 1974.
impression on me; the notion that students could publish a paper that was right in the middle of national politics. I had no idea that six months later in May of 1972 I would be a freshman or first year student at the University of Zambia. It was a thrill of my life and that of my whole family. Beyond the best University education I obtained at University of Zambia, I have made one conclusion after 46 years of observations of many University college newspapers both at UNZA and especially abroad in western universities: the UNZA student papers represented the best and purest form of freedom of expression because of three reasons. 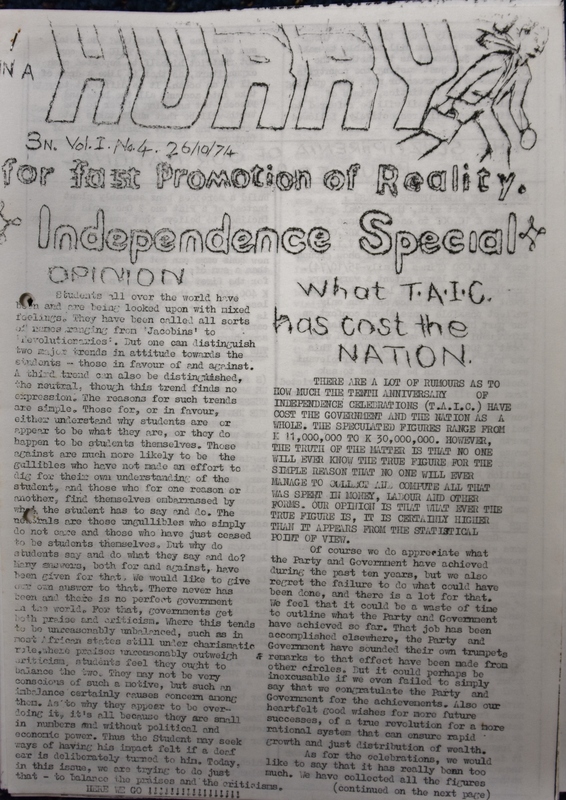 First, the student newspapers UZ Spokesman, later TRUNZA, and In-a-Hurry (which I had co-founded with Dr. Vincent Musakanya) reflected the free, direct, true and unvarnished student expression. This expression was unrestrained by censorship, libel or sedition laws where students could be sued and jailed because of what they had published offended someone. Once four TRUNZA editorial board members were tried in court for sedition and acquitted. Second, the capital for publishing the student papers was so low that it enhanced student expression. The papers were sold at 3ngwee each. 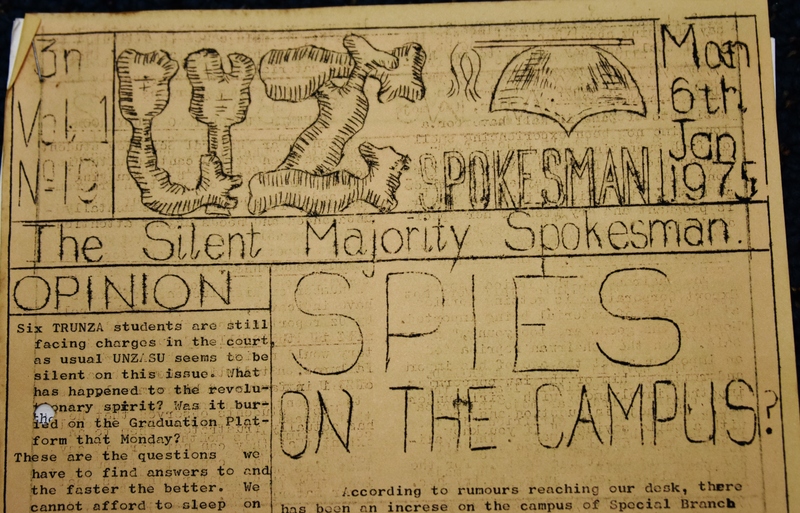 Students used cheap stencils and duplicated the newspapers on regular cheap print paper. The UNZA student papers were not imitating the Times of Zambia or the Zambia Daily Mail which were very expensive or costly to publish. Thirdly, the total freedom of expression meant that vulgarity and insults were sometimes common. However, in the early years of UZ Spokesman vulgarity did not exist. But vulgarity and fierce extreme political opinions became the staple of TRUNZA. Other student papers including our own In-a-Hurry were conservative. Censorship was very limited as both men (mojo) and women (momma) students were often given equal opportunities to insult each other. But one of the best and perhaps tragically ignored aspects about the UNZA student papers is that they reflected some of the best writing in Humanities and the Social Sciences. We were the cream of the nation assembled in one institution. 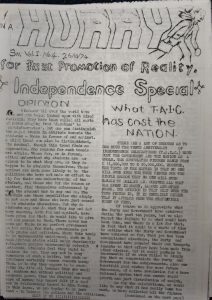 Some of the most creative, humorous, unique intellectual expression, analysis and political commentary were in those student papers including very inspiring poetry. 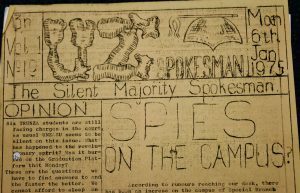 I have never encountered such freedom of expression and creativity in student newspapers in the few Western Universities I have observed over the last 46 years. There is often a misguided notion even among some UNZA former students and may be even the Zambian political leadership and the public that those papers were childish, rubbish or the useless product of children playing in the sandbox. I strongly disagree. What I urge is for the University of Zambia to immediately collect, bind, scan, and digitize all those UNZA student papers starting from 1969. These student papers include UZ Spokesman, In-a-Hurry, TRUNZA, IN and OUT and others. I know where these student newspapers are located in the basement of the University of Zambia Library when I was last in the basement in the 1980s. Deeply buried in those publications are a treasure trove of very significant history of unique knowledge and human creativity that you will not find from students from other Universities in the world.